I am often asked how to best to begin to write a new screenplay or book. As the creator of a writing system that has helped thousands of people write a screenplay in ten weeks, and novelists write novels in a year, I do have an opinion, and a few tricks to make this difficult process easier. The first step in writing a new story is identifying the basic details of character and plot. In my writing system, the creation process starts with identifying defining the characters before locking them into a plot. The characters need to have lives that are already in progress before the specific story you’re planning to write begins. This way, your characters can feel like actual people, and it’s easy to understand their hopes and dreams. Why is this so important? When writers do not understand their characters well, they often build an elaborate plot and then try to force their characters to do what is required for the story to work. This results in flat, unrealistic characters that do not drive the story through their own feelings, and many plot mistakes are made. The dialogue is often weak and the structure feels contrived. So to avoid that, please try the following three. The first step to creating memorable characters and developing a plot is to decide on the genre of the story you are telling. The genre or style you choose will inform your choices, and making good choices is one of the keys to writing well. For example, it would be hard to write a crime story without good guys and bad guys, and certainly a crime or two that must be solved. This gives you clues as to the type and number of characters and action needed. On the other hand, a romantic comedy requires a situation in which two people who basically don’t like each end up together in the end, or who start off loving each other, and the events of the film almost break them up. This allows you to define the type of characters and comic events necessary. To summarize, defining your genre is an efficient way to initially approach the story. The caveat here is that few stories are purely genre or the other, but decide what the overall genre and start there. By the time most writers sit down to work, they have been thinking about the story a lot. You probably know a lot more than you think you do about your new story. The second step is to make a list of all the other things you know about both plot and character. I have found that the easiest and most effective way is to use a technique called “clustering.” Set a timer for 15 minutes, put the name of the character or scene you want to develop in the center, and quickly write down all your thoughts until the timer goes off. Then you can review and see what is there. This tool helps your imagination organize itself on paper. 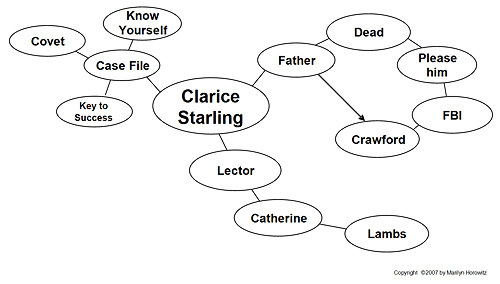 See example below for Clarice Starling from The Silence of the Lambs. To summarize, by working in a non-linear way using a timer, you can let your imagination run wild and will find many new ideas that fit beautifully because your creative unconscious is always working. The third step is not merely to define your characters but to bring them to life. The way to do this is to borrow an acting exercise and do what I call “Taking your character with you.” For an entire day or two, pay attention to what you are doing, wearing, and feeling from the time you wake up, and then compare your actual experience with the imaginary experience your characters might have. Start with the ordinary – how your characters get dressed, what they eat for breakfast, where they work, etc. By experiencing your characters viscerally, you will then start to see them as being three-dimensional and “alive.” You will know how they might react in different situations and will become more confident about the events you need to create for them. To summarize, creating your characters by “taking them with you” as you go about your daily life is a fast track to “living” characters. These three techniques can take you from idea to outline fast and efficiently.